Salvation Mountain is by no means your typical mountain. 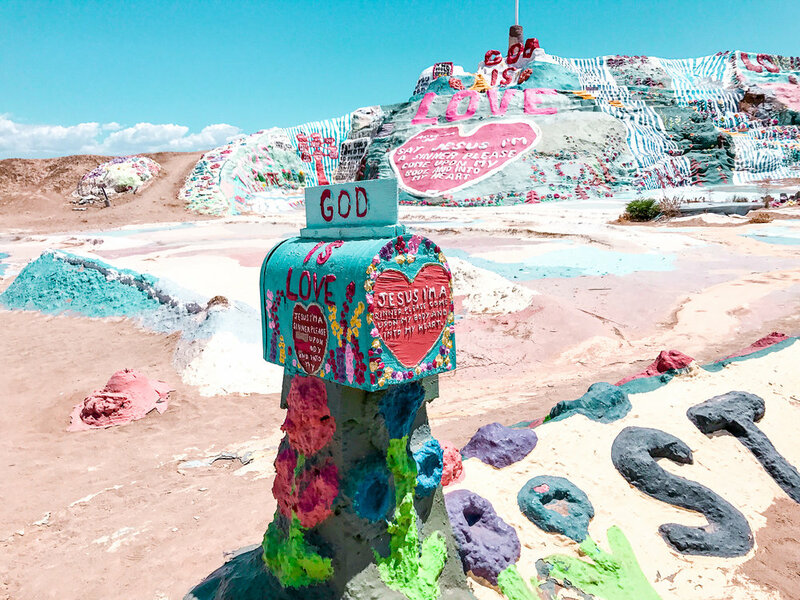 Unlike Everest, Kilimanjaro and the Rockies, Salvation Mountain isn’t a mountain you hike. Instead it’s a mountain you marvel. 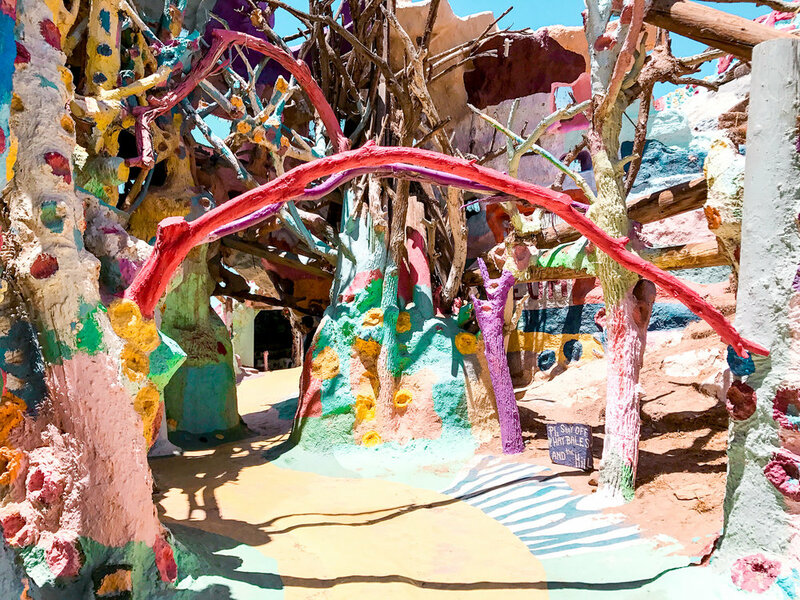 From the kaleidoscope of colors, to words of love and faith, Salvation Mountain is unlike anything I’ve ever seen. Check out my video below to see what I mean! Want to visit? You should! Salvation Mountain is located in Imperial County California. From Palm Springs the drive to the mountain is about an hour and a half along the 86 freeway. You are quite literally driving through the middle of nowhere. But that’s kind of what makes this cool! But just a forewarning, there’s no bathrooms at the mountain, so you gotta take care of business at one of the towns before you get there. When you pull up you’ll be blown away by how much color there is in contrast to the stark desert. Salvation Mountain was created by Leonard Knight as a tribute to God. He covered the mountain with scripture, biblical messages, flowers, trees and a whole bunch of colorful things. He spent his life constantly working on the mountain. The mountain you see today is actually the second mountain he created, because well…the first one crumbled. But that didn’t stop Leonard. He used a combo of adobe clay and straw to build this crazy mountain that still stands to this day. Leonard actually passed away a few years ago, but his legacy lives on. I was first introduced to the mountain when I did a story for our TV station about how the mountain had fallen on hard times since Leonard’s passing. He was the only person who worked on the mountain EVERY DAY. So when he passed, someone had to take on that work. And that’s where Ron comes in. He is now the caretaker of the mountain and has picked up right where Leonard left off. He lives on site and you will most certainly see him when you visit. You might actually hear him before you see him if you happen to wander off the designated walking path. He has a mega phone and he’s not afraid to use it lol. I’ll link to that original story here because it’s one of the stories I’m proudest of. In the story Ron talked about how he needed donations of latex paint to maintain the mountain. After the story ran he got TONS of donations. We checked back with Ron a year later and that was the first thing he told us. People from all over saw the story and brought paint to donate. In the TV news biz you never really know if you’re making a difference in the lives of others. But this was certainly proof that I made a small contribution to this incredible landmark. So, the next time you’re in Palm Springs I HIGHLY recommend making the trip out to Salvation Mountain. And don’t forget to take TONS of pictures!